The EV revolution has come to Gaydon. It has begun, at least for Aston Martin. The UK-based sports car company has just confirmed it will build the all-electric RapidE beginning in 2019. However, production will be limited to just 155 units. The RapidE will be Aston Martin’s first all-electric model, spearheading the company’s Second Century Plan that will eventually see additional low- and zero-emission vehicles. Based on the Rapide AMR, which was first shown last March at Geneva, the RapidE ditches the 6.0-liter V12 for an electric powertrain, details of which will be announced later. So we know the RapidE will be a sleek four-door sedan – just like the Tesla Model S. Coincidence? We think not. The Rapide is the ideal first car for Aston Martin to make all-electric because it’s also its largest and most conventional model. Williams Advanced Engineering has been brought in as lead engineering partner, which is another sign that Aston Martin is dead serious about this whole EV thing; it’s laying the initial groundwork for an EV future. “Having revealed the RapidE concept back in October 2015 we reach another milestone with the confirmation that we are now putting the first all-electric Aston Martin into production,” stated CEO Dr. Andy Palmer. 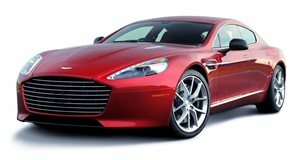 “RapidE represents a sustainable future in which Aston Martin’s values of seductive style and supreme performance don’t merely co-exist alongside a new zero-emission powertrain, but are enhanced by it.” For EV skeptics and other haters, Palmer did reiterate that the “internal combustion engine...will continue to be (at the heart of Aston Martin) for years to come.” Successful change takes time.